I know I just made one barely 3 days ago, but I spent most of today creating a new one. I made this by (heavily) modifying the code that was originally meant for my main blog before the current identical-looking version was used. Since I heavily modify it beyond recognition, it would be safe to say that I made it. This was taken shortly before the change, so the navigation menu and the search bar has already been separated and the video size reduced. The empty space on the right is the space for an ad, but there's nothing to display there. However, this wasn't what it was supposed to look like and is supported to be identical to the English version, but due to technical difficulties with the blog layout of the latter, only the colours and images were used instead of an entire change. 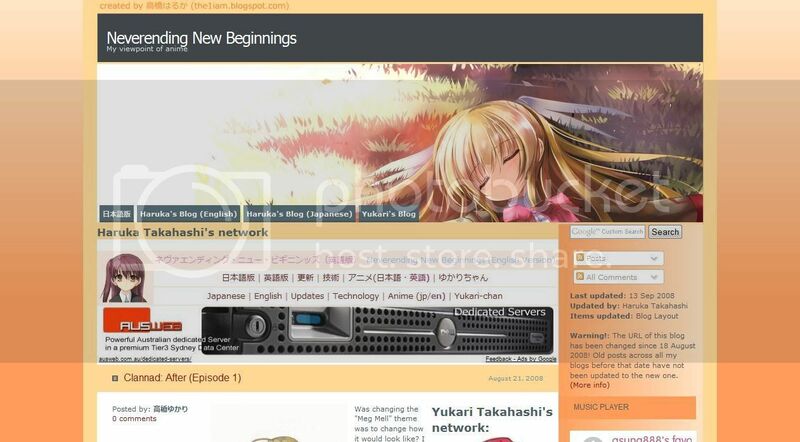 Since then, the English version layout was replaced with a layout identical to the layout you see here, the updates blog, and then the layout mentioned in the previous post. Ah, did you notice? As time passed by, you could see more and more of the first post of the blog. I want to apply this to more blogs, but the layouts there are too nice to replace or would not be suitable. In case you were wondering, this is based on an identical theme that was designed for Wordpress blogs. 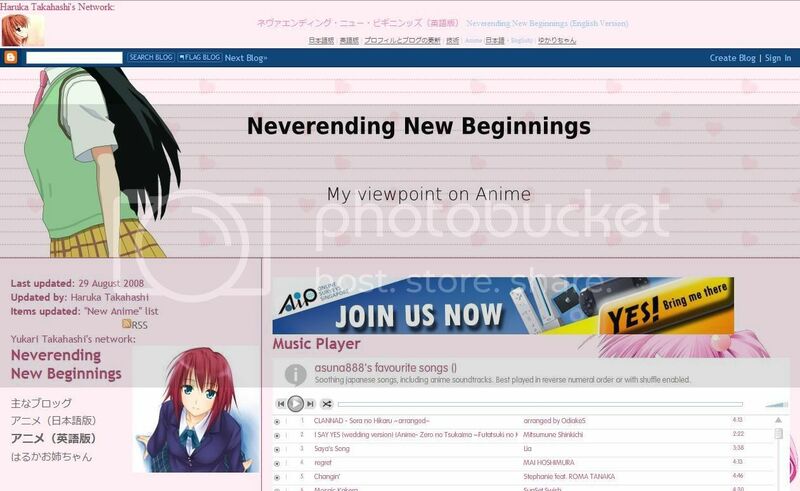 I have applied a new layout to the English edition of the anime blog earlier. This layout is different from what I mentioned earlier, which I ended up applying to one of my hidden blogs, but the drawings does use that theme. Anyways, I changed the themed because it seemed somewhat ugly and outdated because it was made for the autumn theme (which was back in October...) and eyesore to look at now to me. 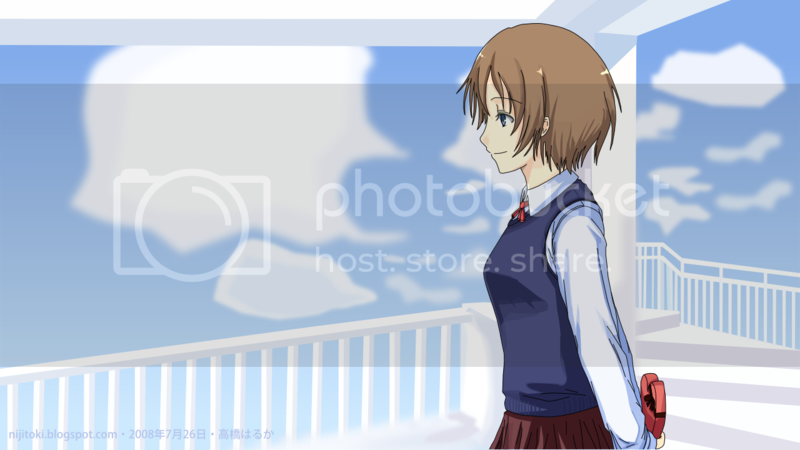 If you find that banner image familiar, that's because the character is from v0051 of my vectors I did back in end-December 2008, which is from "K-on! 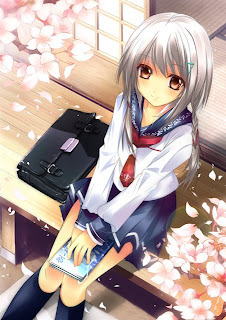 (けいおん！)" that has an April (Spring) 2009 anime. It's also used as the banner of my IMEEM profile, though the character is larger in terms of DPI. For the background, it's based on the widescreen version of v0003. I'm not sure if I should call this layout theme as complete. I think I should add Twitter and IMEEM links there seeing that I had those added to my main blog. I might also use this layout on the drawings blog too as that is ugly as hell too. 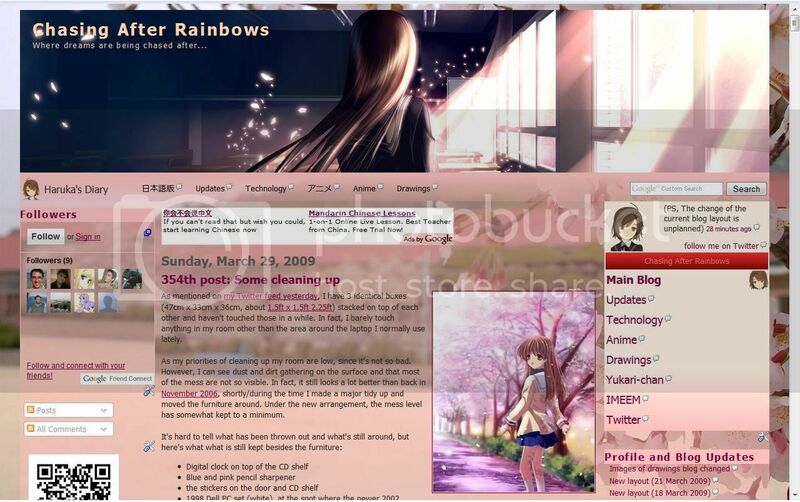 Since most of the post there are uploaded via Windows Live Writer, you might see the background of the old one. As for the reason why only the "Vector (current)" is not clear is because of that program. Besides, I don't want to use up a lot of the limited Blogger/Picasa total image space of 1GB. The above are the changes I had made to the existing anime watch list of both the English and Japanese versions of my main blog. The only changes I made was to add images to the left of the title, table borders more visible, and to align the episode numbers at the center. With just these, you can already see the difference as compared to the earlier version that contains only text and links. The idea came shortly after making thumbnails as a solution to the inconsistent thumbnails for my drawings not too long ago. Except for "To Aru Majutsu no Index", the thumbnails are made from a quick search using Google Images. "To Aru Majutsu no Index" uses the same image as that for my vector thumbnails. There are vectors done for "Clannad" and "Toradora!" series, but they don't describe the series well and/or don't contain (one of) the main character(s). If I can come up with an idea on how to make this better and the time to do it, I would, but now is not the time for it. Vector v0068 is about half done and "Alternate Dimension (Part 23)" is almost done. The sidebar navigation menu and drawings widget (both old and new) are both created by me from scratch. 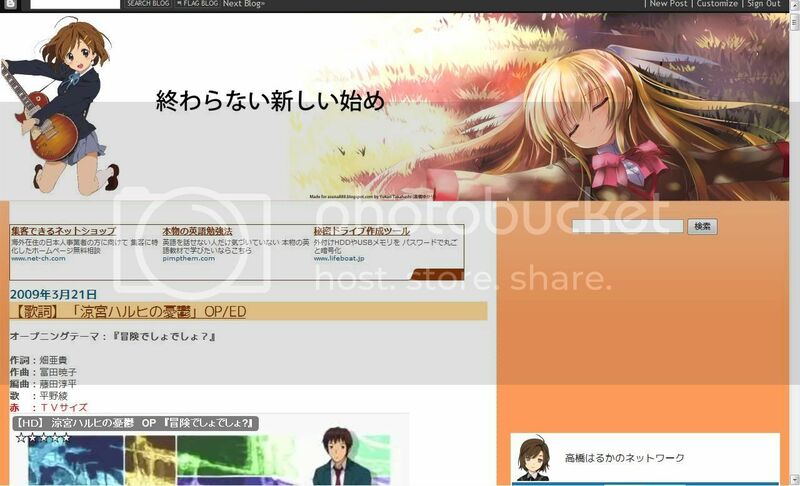 Due to technical reasons, I can't upgrade the anime watch list that appears on the Japanese-language anime blog. Also, I'm aware that, for Internet Explorer users, my drawings may appear larger than your browser window. The cause of this is the percent (%) based instead of pixel (px) based value for the width of the image. With the final version of IE8 releasing quite soon and the fact that other browsers that are more web-standards compliant like Firefox and Safari/Crome renders it correctly, I don't see the point of fixing it, especially IE6, which is considered outdated but ironically still widely used today. Blame this on people not aware/seeing the need to upgrade, preferring XP over Vista on a new PC for "compatibility reasons" or cite problems in Vista they heard that has already been fixed a long time ago. Seeing that I am busy until mid-March, most of my stuff will not be updated for quite a while. I'm aware that the post on most of my blogs (except the main English) doesn't have any new posts for quite a while. 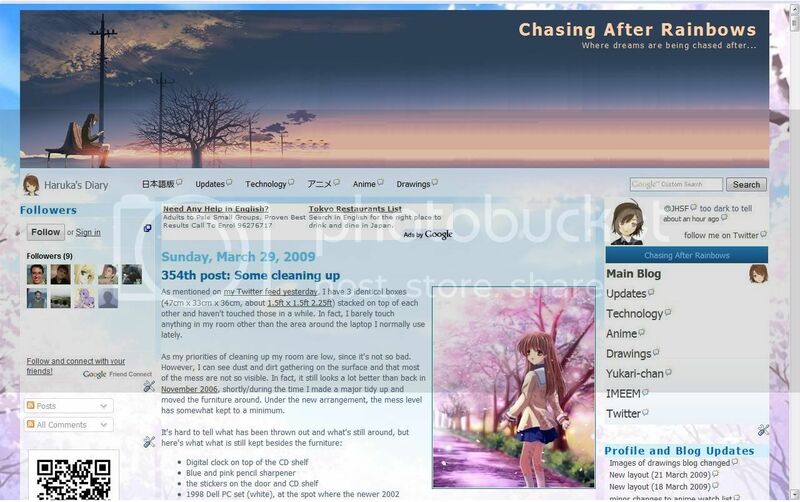 What I had done recently is updating of a forum, my YouTube Channel, IMEEM profile, and dannychoo.com profile. As long time readers might know, the English anime blog was originally my main blog, which itself succeeded this updates blog. Anyways, that layout you see currently was actually replaced with an another identical layout, but was buggy. That's why you didn't see me changing the Japanese version other than the colours and images. The layout I replaced with was actually base on my current main blog theme that was used for Autumn and modify the codes to remove the left sidebar and making it look similar to the earlier. 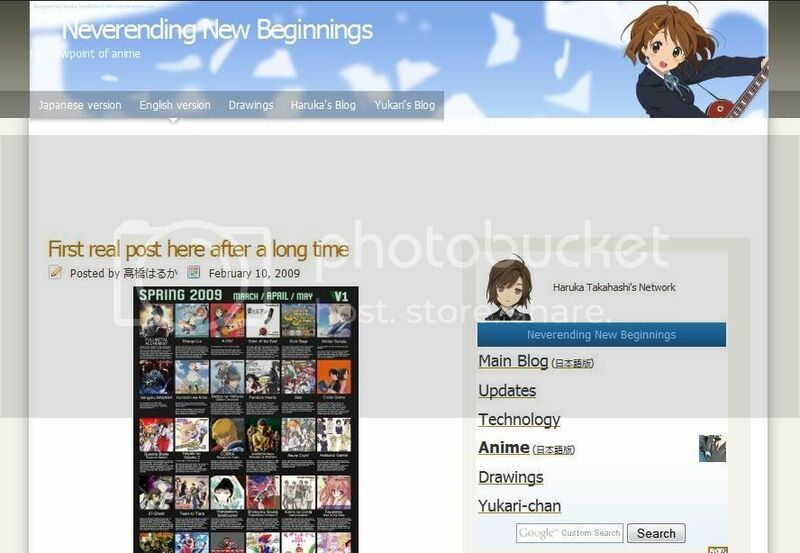 If you were to click the link at the bottom of my blogs that is based on this layout (basically all except the ones with Yukari as the co-author), you would notice it bares very little resemblance to the original as I had heavily modify it. The drawings and anime blogs (both english and japanese) need to be revamped as the current layout looks horrible compared to my main english and technology blogs. Unfortunately, I won't be able to change it for quite a while and may not even bother changing. On the english anime blog, you might notice me putting up this post. The truth behind this post is that I want to put up reviews of recent anime episodes. But I lack the time to post such things and the time it takes for me to vector or write a story eats up a lot of hours.